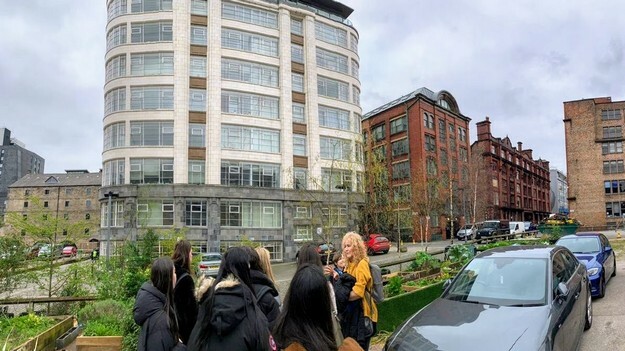 On the 16th October 1889, a meeting was held at Lady-Barn House in Fallowfield to discuss the desirability for establishing a school for girls, aged twelve and upwards. Those attending the meeting included all of our Founders, who decided to form the first official committee meeting three days later. 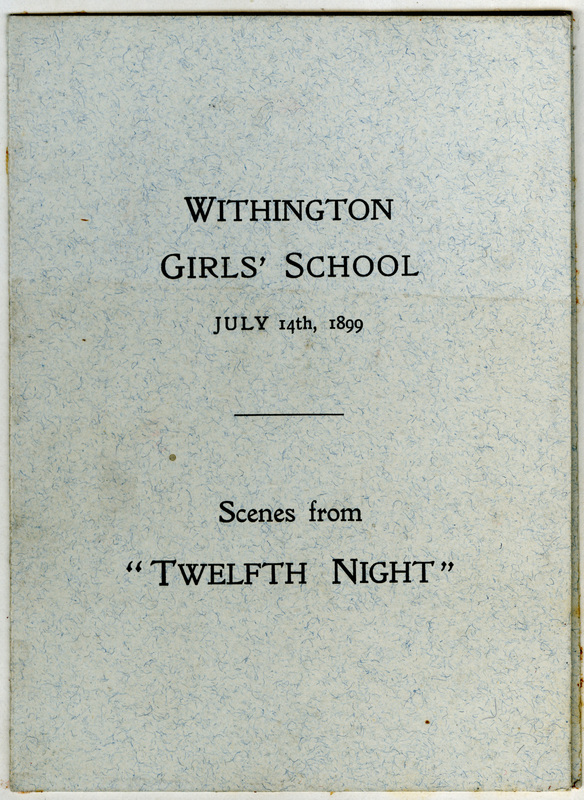 In December 1889, it was decided that Miss Ker, second mistress (Deputy Head) of Croydon High School and a former Cambridge scholar was to be appointed the first Headmistress of Withington Girls’ School. Miss Ker was to receive a salary alongside board and lodging at the first schoolhouse, based on Mauldeth Road. Below are two images. The first is an excerpt of a letter from Mrs Caroline Herford to Miss Ker. 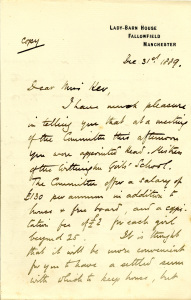 This letter is outlining the confirmation of Miss Ker’s appointment as Withington’s first Headmistress. The second is an article from the Stockport Chronicle dated 21st March 1890. 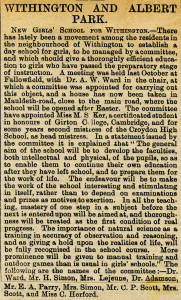 The newspaper clipping describes the establishment of the school and the council’s endeavours to make future learning interesting and fulfilling. Initially, the schoolhouse based on Mauldeth road, did not only provide a roof for the headmistress, but also boarders too. The school was situated at this location until 1903 when it was decided that the house was deteriorating and there was not enough space for the increasing numbers. 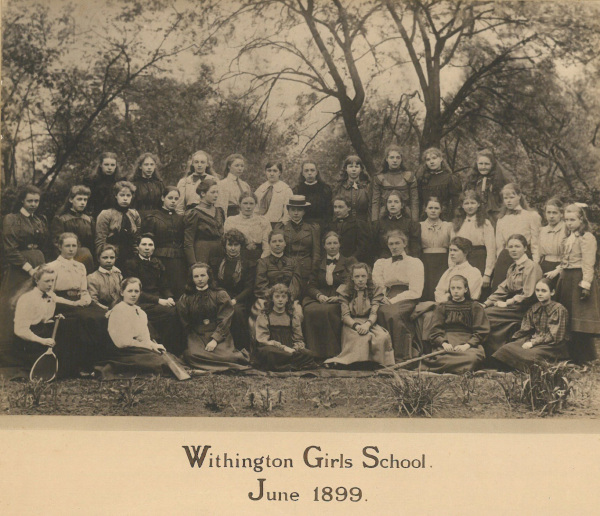 Withington Girls’ School then moved to its current location on Wellington Road with thanks to the Founders and with special support from Mrs Simon. 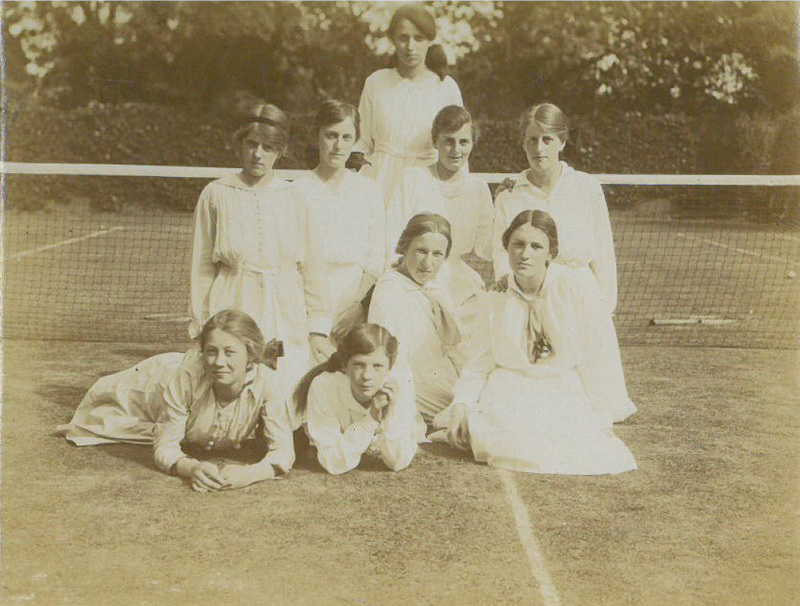 This is a whole school photograph taken in 1899. 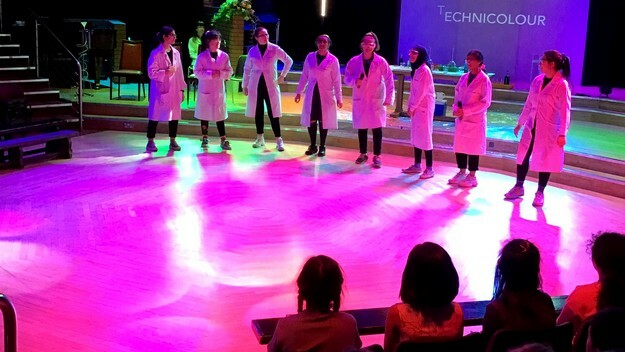 At the centre, you can see several staff members, including Miss Greenwood and Miss Ashworth. 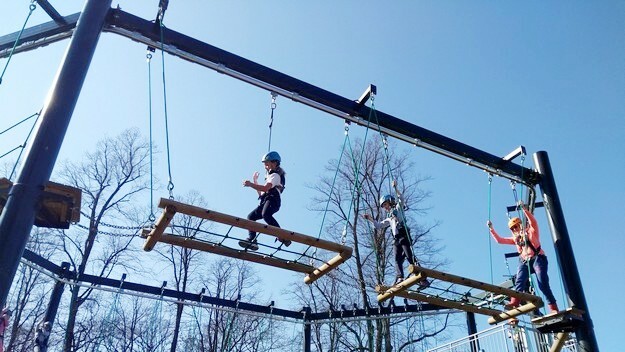 You can also see in the photograph that some of the pupils have been positioned for the camera holding various items of sports equipment. 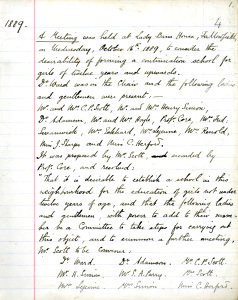 Sporting activities played a large role in school life and the very first donation to the school in 1891 was a cricket bat, ball and wicket from the City Council. This photograph documents spectators watching a game of cricket during the early years of the school. 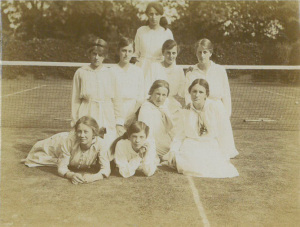 Many matches were played against local institutions such as Whalley Range School, Ladybarn House, North Manchester High School, Woodlands and Bolton High School. In addition to the cricket equipment, two tennis rackets and a picture to be played for at an annual tournament were donated to the school. 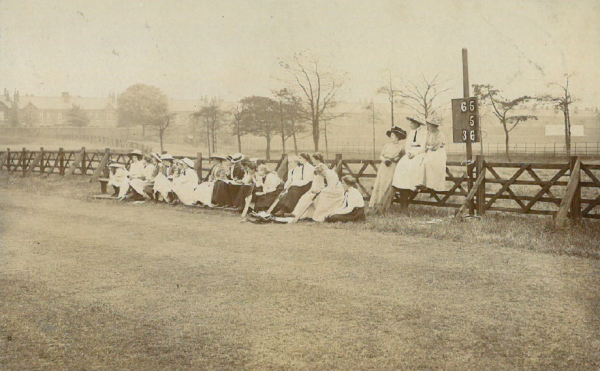 In 1899, four pupils played against Newcastle under Lyme on the Newcastle ground. They had an outstanding success, winning every match! 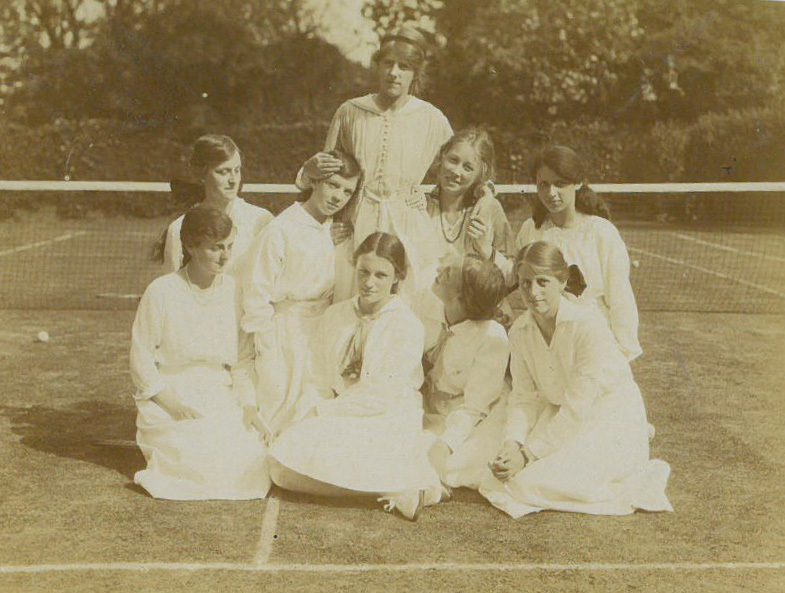 These two images show a group of tennis players photographed during, or a little after this period. 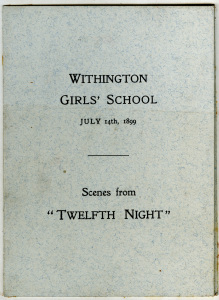 Alongside cricket, lacrosse and tennis matches, the girls performed numerous plays and productions. 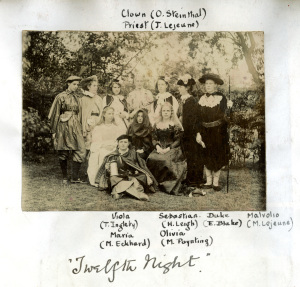 The images below document a performance of Twelfth Night in 1899.